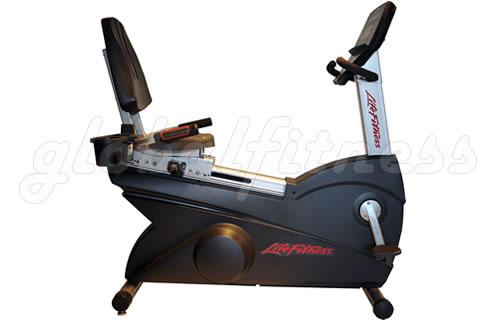 This exclusively styled Life Fitness 9500RHR LifeCycle Recumbent is remanufactured to resemble the Integrity Series bike by Life Fitness. These Life Cycles are all designed to reduce stress on the rider, particularly in the knees, hips, and back, but the Life Cycle 9500RHR Next Generation climbs to a new level of smooth cycling. From its comfortable seat with built-in grooves for coolness and back-support, to the natural placement of the accessory tray and hand sensors, few elements of ergonomics are overlooked on this cycle. The belt-drive system is reliable and quiet and even the "Wide Ride" pedals can be configured 11 different ways to accommodate your foot size. The bike also is self-power generated and is equipped with a dual level LED message center and 18 workout programs and heart rate monitoring. This edition of the Life Fitness 9500 RHR really modernizes the celebrated lifecycle and allows clubs to update their inventory at a lower cost and will seamlessly coordinate with the newer series Life Fitness products.